The Cross Training Sports Camps ministry actually began as a request for a week long sports camp to be held on a North American Indian Reservation in Red Lodge, Montana in 2002. From that early work, the United States ministry has grown multiple local camps for children in Gainesville, Georgia and various camps lead in partnership with churches around the nation. One of the most unique outgrowths of the ministry has been the start of camps for special needs children. The Elsie Conde Camp in Gainesville began in 2009 to provide a week of free camp for these children who may have never been able to attend any camp. 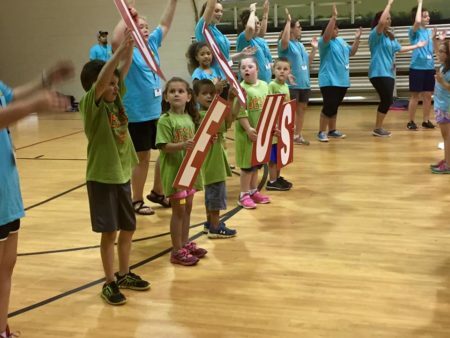 Cross Training Sports Camps allow volunteers to enter any community and set up sports and sound equipment, snacks, and treats for a day of camp. The rotation model allows children to form different groups to learn sports like soccer, softball, volleyball and group games. One rotation is “cross training”; in this group campers hear Bible stories and Christian teachings.